Born 1969 in New York, USA. Tara lives and works in Brooklyn, New York. She obtained her BFA at the Corcoran College of Art and Design in Washington, D.C.; earned her MFA at Virginia Commonwealth University. Donovan’s work uses everyday manufactured materials such as scotch tape, styrofoam cups, and drinking straws to create large scale sculptures that often have a biomorphic quality. Her work was featured in the Whitney Biennial in 2000 and the All Soviet Exhibition. Donovan installed Untitled (Mylar) in November 2007 at the Metropolitan Museum of Art, New York. 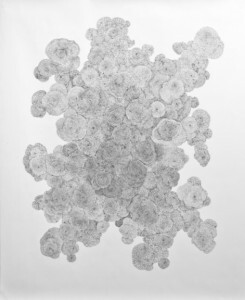 In 2012/13, Tara Donovan’s work was featured in Girls’ Club’s Following the Line exhibition.